Newspaper report of the official opening of the Blackpool & Lytham Railway in 1863. Another line has been added to the now extensive "system" of Lancashire railways. The Preston and Wyre Railway was planned and formed in the comparative infancy of railway travelling, and taking a nearly direct route between its termini, the ancient borough of Preston and the new port of Fleetwood, it skirted the old towns of Kirkham and Poulton, but altogether “ignored," as the modern phrase is, the watering places of Lytham and Blackpool. These towns, which grow with the rest of Lancashire and partake of the general prosperity of the Kingdom, could not, however, continue to be long over­looked, so branches from the parent line were made to the coast, one branching off from Kirkham to Lytham, the other from Poulton to Blackpool. Unlike many railway extensions and branches, these off-shoots of the Wyre line have been advantageous to the lessees for they have contributed a large and increasing traffic to the company, and for years back they have been a great convenience to the vast numbers of persons travelling to the coast of Lancashire for health or pleasure. It has, however, been found that one large class was not provided for in this ar­rangement, the persons who, during the summer months, desire to travel between the two towns. Who, that has ever spent a few days at Blackpool, has not included a trip to Lytham in his programme, and who, that has So­journed a little while at Lytham, has not desired to pay a visit to Blackpool. They are only seven miles apart, yet nearly seventeen miles of railway had to be traversed before one place could be reached from the other; indeed, the Wyre railway between Lytham and Blackpool was, instead of being a straight line, something like three sides of a square. This circumlocution was not the only incon­venience, for passengers between the two places had usually a long stoppage to submit to at Kirkham or Poulton or both, and one or two changes of car­riages to boot. From time to time suggestions have been made for the formation of a direct line, and frequent ad­vances have been made to the lessees of the Wyre Railway with the view of inducing them to form a connection be­tween the two places on the coast, but the company have suffered so much from branches, and extensions, and now lines, so many of which have been anything but "feeders" of traffic that they were loath to encourage new undertak­ings. Finding the company unwilling to make the line, some gentlemen at Lytham formed an independent com­pany, and receiving every encouragement from the lord of the soil, Colonel Clifton, to whose estate it will be of great advantage, and his enterprising agent, James Fair, Esq., an act of parliament was obtained early in the session of 1861, and in September of that year the " first sod" was cut by the young squire, the heir of the Lytham estates. The line was found to be easy of formation, and it was completed in little more than twelve months, but in con­sequence of the winter traffic being but light it was con­sidered advisable to postpone the "opening" until the eve of the "season" of 1863. The arrangements being per­fected, the line was “opened" on Monday—perhaps we should say Saturday, for on that day a great number of trains ran between the two places, a free ride being al­lowed to all corners. The opening of the line, on Monday, was celebrated in Lytham as a general holiday. Flags were flying from the public buildings and the more important houses and places of business, and the place generally wore its gayest aspect. The bells of the Parish Church also welcomed the occasion with merry peals. The day, too, was fine and warm, and, though rather early in the season, such a one as is most enjoyable at the sea side. The Lytham terminus of the line is at present in a new street, which forms a continuation of Dicconson-terrace, and not far from the principal entrance to Lytham Park. This has, however, been removed a little to the north of the line, but the park gates and lodge have been re-erected on their new site, under the charge of Mr. Hibbert, archi­tect, of this town, rail for rail, and stone for stone, exactly as they stood before. 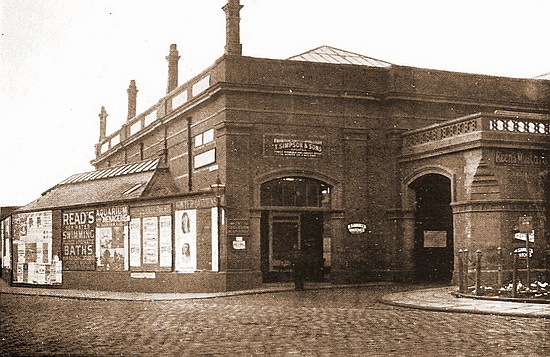 The station at Lytham, which, were we in a fault-finding humour, we should say has been built sadly too small, as has also that at Black­pool, was thronged throughout Monday by persons anxious to he passengers, and by others watching with interest the arrival and departure of the various trains. Having had the pleasure of travelling by the new line, a brief description may not be uninteresting, but before doing this we must congratulate the company on the commodious and convenient character of their carriages. Both classes (there are only first and third) are lofty and roomy, and far superior to the vehicles in which travellers are usually "cribbed, cabined, and confined." Immediately on leav­ing the station, the line enters Lytham Park, which, though wanting in some of the features of sylvan scenery which give a charm to the landscape, is not without pretty views. In a little while we have a fine view of the hall, the residence of Colonel Clifton, a spacious and commodious mansion, built for his great grandfather, Thomas Clifton, Esq., about the middle of the last century, by Mr. Carr, of York, the architect of the last Preston Town Hall. Leaving the park, we come to the sand hills, a desert like country, hitherto abandoned to the rabbits, but fast being encroached upon by the westward march of the Lytham villas. Here another "Lytham" is planned to be erected. Roads are to be laid out, convenient stations are to be built on the new line, and some hundreds of acres of land, hitherto unproductive, is intended to be the site of villas. Indeed, already, several plots have been sold, on which first-class mansions are to be forthwith erected. Between the sand hills a glimpse is now and then caught of the estuary of the Ribble, with here and there a sail of some craft trading to the “port of Preston." Beyond the water, and skirting the opposite shore of the estuary, is Southport; while further inland is distinctly visible the parish church of North Meols; and, beyond. Ashurst's beacon, and the hills of Anglezark and Rivington; and to the west, Hoghton Tower and Pendle Hill. In another direction, we see a large extent of the Fylde country, with its numerous windmills and farmhouses and cottages. Having passed the village of Heyhouses, with its numerous white cottages, we are near the mouth of the Ribble, and make a detour northward, leaving to our left the Double Stanner, on which the Ribble lighthouse lately stood. When the line was planned, the lighthouse was so conspicuous a landmark, that a representation of it forms a part of the "common seal" of the railway company, yet, before the line was actually opened, the lighthouse bad passed to the domain of history, and is not, it appears, to be replaced. The vast extent of sandy land to our right is called Cross Slack, a name of holy association, for tradition says a church or oratory once stood there, of which, however, nothing remains but the name preserved in the emblem of man's salvation. The soil hereabouts is of that character that shows the wisdom of Colonel Clifton encouraging the line. Apart from the vast quantity of land which the railway will make first-rate sites for villas, there is much light sand that is at present unavailable for agricultural pur­poses, and all but valueless to the owner. It, however, only wants marling, to make it produce the finest crops; yet, hitherto, its distance from the marl fields has prevented its being rendered available. During the winter months, it is intended to bring a large quantity of marl by rail to these sand hills. Next to Cross Slack, and smiling like an oasis in a desert, is the well-managed farm of Mr. Richard Cookson, Layton Hawes. Mr. Cookson has long been one of the most enterprising farmers in the Fylde, and we were glad to hear that his efforts at agricultural improvement had been so appreciated by his landlord that he has had his lease renewed for a long term of years, at the old rent. Travellers by this line, who have any taste for farming, will be sure to notice Layton Hawes, and some may re­member its tenant, in another capacity, a leader of the opposition to free trade, and a predictor of ruin to agri­culture from the repeal of the Corn Laws. They will all rejoice at the falsification of Mr. Cookson’s prophecies; 'for our own part, we always thought that he was a better farmer than political economist. And now we leave Col. Clifton's estate, five miles and six furlongs, out of the seven miles and forty-two chains of the whole line, being on his land. We are soon at South Shore, where there is a station, and where we see before us Marton Church and the now large town of Blackpool. South Shore was quite astir, for, no doubt, the railway will be of great service in developing the resources of that agreeable suburb of Blackpool. Again the train was on its route, and we ar­rived at the Blackpool Station, at Hound-hill, the plans for -which, we fear, were based on a calculation of the winter traffic on the line, for it was crowded to inconvenience. At Blackpool, a party of ladies and gentlemen sat down, as the guests of Colonel Clifton, to an elegant luncheon, served by Mr. Birch, of the Clifton Arms Hotel. James Fair, Esq., presided. The company congratulated the chairman on the manner in which the day's celebration had gone off; and “Success to the railway," “Colonel Clifton, and better health to him, "and” the ladies", were duly honoured in the juice of the grape. At the Clifton Arms Hotel, Lytham, a party of gentlemen dined together, 'Thomas Fair, Esq., in the chair; and here, as at Black­pool, "Success to the railway" was not forgotten. The catering was on Mr. Knowles's usual hospitable scale. As yet only a single line of rails has been laid, but the permanent way will easily admit of a duplicate set. The engineer of the line is Mr. T. B. Foster, and the con­tractor Mr. J. R. Allen. The line has only one drawback and that, it is to be hoped, will only be of a temporary character. It is, as yet, isolated and unconnected with the other line. It was intended, last year, to go to par­liament for powers to form a new line from Preston to Lytham, by the coast, and, by joining this new line, so have a new and independent line to Blackpool. This would obviate the inconveniences which the Lytham and Blackpool passengers at present suffer at Kirkham and Poulton. Such a line would, however, be strongly opposed by the owners of the Wyre Railway; and as the Blackpool and Lytham line has been formed in no spirit of hostility to that concern, probably some course may be taken which shall join the present railway with the Wyre line and still give Preston a shorter and more convenient line to Lytham. This might be done by branching off about Lea, in which case the Wyre Railway proprietors would have the advantage of the traffic ever a few miles of their line and the new Company would be saved the cost of an expensive entrance into Preston. Perhaps, the former might be then induced to make the line, if favourable terms were offered by the landowners, for a large extent of land would become valuable for building purposes, at Lea, Freckleton, and Warton, were a coast line formed.